I love handmade items and these Crochet Dishcloths are so pretty can't wait to have them in my kitchen. My Daughter and Mom are going to help me make them all. We may even make a set for each of the girls in our family. 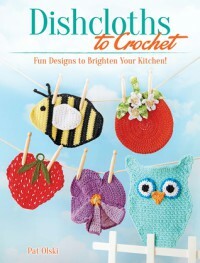 The book is filled with easy to follow instructions but you do have to know a little about crochet and how to read the patterns. There are 25 patterns in the book, not just the 5 on the cover. There is a list of the abbreviations and a needle conversion chart. Each pattern shows a picture of the finished product, dimensions, the best yarns to use, notions needs, needle size, and a stitch glossary. With the 25 patterns you can make these to go with pretty much any kitchen decor. There are animals, fruits, and flowers to choose from. You can make them in any color you want even.